Photograph of Harold Delmont Sawyer and Ethel R. (Darling) Sawyer, before or after their marriage on 29 November 1899 at Mattamiscontis, Maine. The identification on the reverse indicates that their marriage ended in 1902. I don't believe they had any children but I could be wrong. Harold Delmont Sawyer was born 28 March 1876 at Medford, Maine, the son of Ethan C. G. Sawyer and Sara (Johnston) Sawyer, who were born at Medford, Maine, and Maxfield, Maine, respectively. Harold was a harness maker. After his divorce he made his way to coastal Maine. 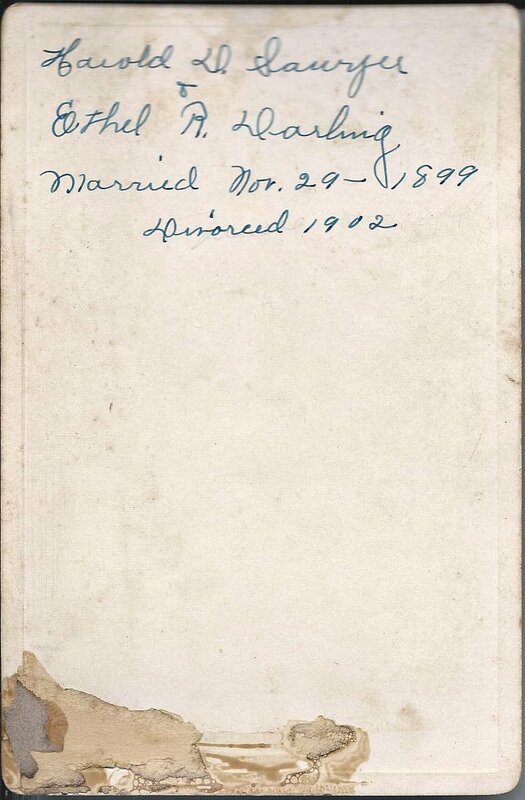 On 7 February 1906 at Warren, Maine, Harold married Nova Scotia native Margaret A. Brown, daughter of Mathew L. and Augusta (Bird) Brown of Nova Scotia. They had at least two children. Ethel R. Darling was born at Enfield, Maine, about January 1882, the daughter of George W. and Hattie J. (Spencer) Darling, who were born at Blue Hill, Maine, and Enfield, Maine, respectively. 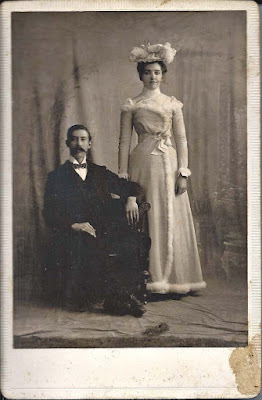 After her divorce from Harold Delmont Sawyer, Ethel married George Daniel Faloon on 25 December 1902. George was the son of John Edward Faloon and Laura "Hannah" (Hanson) Faloon. George was born about March 1862 at Medway, Maine. Ethel and George lived at Howland, Maine, where they raised a family of three children, I believe. George worked at a paper mill.